Check out Tobi's In Your Head Halter Blouse We love the boho vibes of the Black In Your Head Halter Blouse. 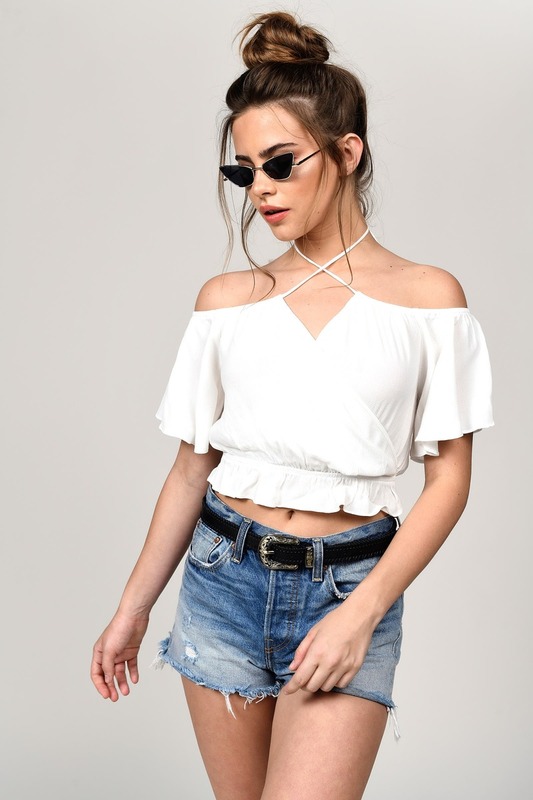 This gauzy hippie blouse has a surplice bodice with delicate criss cross straps, short flutter sleeves, a frill hem and cold shoulder cutouts. Team with corduroy for contrast. We love the boho vibes of the Black In Your Head Halter Blouse. This gauzy hippie blouse has a surplice bodice with delicate criss cross straps, short flutter sleeves, a frill hem and cold shoulder cutouts. Team with corduroy for contrast. We love the boho vibes of the White In Your Head Halter Blouse. This gauzy hippie blouse has a surplice bodice with delicate criss cross straps, short flutter sleeves, a frill hem and cold shoulder cutouts. Team with corduroy for contrast.